Nuts can be very nutritious and are rich in protein, fiber, vitamins and minerals. As with any snack, nuts are healthy with moderation. 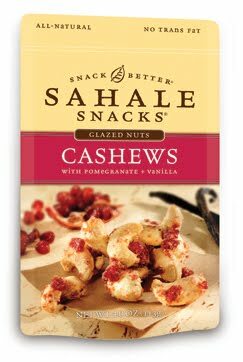 I recently contacted Sahale Snacks and asked if I could review a few of their products for Snack Mania and they agreed and generously offered to sponsor a giveaway. One of my winners will have the opportunity in winning a small sampler of snacks and a T'shirt. SahaleSnacks.com offers various snacks to suit your needs. SEASONED NUTS, BISCOTTI CRISPS™, GLAZED NUTS, and NUT BLENDS. All products in a variety of flavors and assortments. A little tidbit about how Sahale Snacks began! Our first line of snacks, the nut blends, are unique combinations of premium nuts, dried fruits, and exotic spices, each reflecting a beautiful location, culture and/or culinary tradition somewhere in the world. They are all natural, delicious, conveniently packaged, and full of nutrition. Recently we added a line of lightly glazed nuts with great fruits like raspberry, strawberry, and pomegranate. We use whole ingredients in their natural form -- such as cashews, almonds, pecans, hazelnuts, pumpkin seeds, macadamia nuts, and peanuts -- and combine them with naturally dried and preservative-free (unsulphured) fruits, then add fabulous ingredients like organic orange blossom honey, lemongrass, balsamic vinegar, Moroccan harissa, or pure ground Madagascar vanilla beans. Take us on your next adventure. Like falcon, sacred, and high lofty place. The pecans are my favorite out of the four! I had wondered at first whether or not the blends would taste well together. Pecans with Sweet Cranberries, Black Pepper & Orange Zest? I think the ingredient "pepper" threw me off. However, it was the first product I tried and I have to admit that these pecans are delectable! I tasted a light glaze on the pecans which must have been the orange zest with pepper and the dried cranberries were sweet which blended well with the other flavors. We think we've found a perfect combination of sublime flavors: Pomegranate, Vanilla, and Cashews. Our whole roasted Cashews are teamed with Pomegranate and Apple, and balanced with pure Vanilla bean. Our light glaze adds just the right amount of sweetness. I love cashews...ok, I love most nuts! These cashews are very flavorful and you can taste the pomegranate and a light vanilla flavor with each bite. I considered the audience they are trying to attract with these cashews and still came to the conclusion that I would love to taste more vanilla flavoring on them. This product is available in Starbucks stores nationwide. An exotic, piquant combination of Pistachios and Pepitas, sweetened by figs and honey, and finished with a peppery kick of Moroccan Harissa. The pistachios are wonderful! They are rich in flavor and the blend of pistachios, figs, sesame seeds, etc. bring the sweet & salty flavors that I adore. Enjoy the harmony of classic tastes with an all-natural twist. Our Barbeque Almonds are seasoned with a proprietary “Dry Rub” spice blend and accented with tangy buttermilk ranch. Then, they’re slow roasted to a smoky, spicy-sweet perfection. I am going to be honest, I'm indifferent about this product. I felt the BBQ flavor was too strong for my personal taste. However, my husband thought they were pleasant. My husband is the type who enjoys BBQ anything, including sunflower seeds so he was the perfect individual to try these almonds. Not to mention that almonds are his favorite nuts. He really enjoys them however they are made or natural with raisins. This product is available in Starbucks stores nationwide. Don't want to wait and see if you are a winner? I don't blame you, these snacks are unique and delicious! 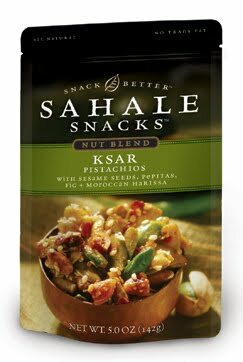 Order Sahale snacks directly from Snackdirect.com or find a store near you! One of my readers will win a sampler of Sahale Snacks and a T'shirt! What product from SahaleSnacks.com are you interested in trying? They have more flavors and products than I mentioned in my blog post, please check them out! *Post a comment on my Snack Mania blog post. Disclaimer: I simply received a sample of products from Sahale Snacks and have posted my own, personal and unbiased opinions. I hold no responsibility between you and the company, and/or products you may purchase or receive from them. **All graphics & quotes in this review and giveaway are property of Sahale snacks and are not to be copied or distributed without proper permission from the company. Valdosta! Pecans with Sweet Cranberries, Black Pepper + Orange Zest, yum! Posted a comment on Snack Mania blog post. I would most want to try the Pomegranate Cashew Biscotti Crisps! I commented on your Snack Mania post! 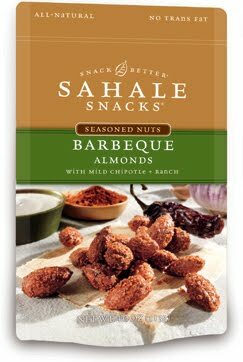 I would like to try Sahale's Barbeque Almonds with Mild Chipotle + Ranch. I am most interested in trying the Sing Buri Nut Blend. I like the Glazed Cashews. I am dying to try those crisps! I commented on snack mania! 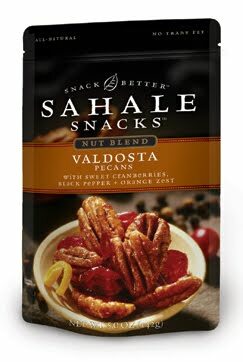 I am a FB fan of Sahale Snacks! I'm now your google friend/follower! I would like to try the Tuscan almonds, southwest cashews and almond pb & J. *Posted a comment on my Snack Mania blog post. I have tasted the Soledad and they are way too good. Next I would like to try the Socorro. Thanks! I would love to try the Banana Walnut Chocolate Crisps. i want to try pomegranate cashew and cranberry pecan! I'd like to try the Cranberry Pecan Biscotte Crisps. Yum! I've had the Ksar and Sing Buri Nut Blends before and like them. I'd like to try the Southwest Cashews, Tuscan Almonds, and Almond Vanilla Latte Biscotti Crisps. I like to try the southwest cashews. I'd like to try the Cranberry Pecan Biscotti crisps. I'd love to try the Valdosta Nut Blend :) *Thanks* for the giveaway! Pomegranate Cashew Biscotti Crisps, I want to try something that is different with a real interesting name. I pick those Cranberry Pecan Biscotti Crisps. I would like to try the Almond Vanilla Latte Crisp. I am following Sahale Snacks via Twitter as jlsc123. I am a fan of Sahale Smacks via Facebook as Jill Myrick. I'd love to try the Banana Walnut Chocolate Biscotti Crisps. I would like to try the southwest cashews. Following Sahale snacks on Facebook. My name: Sarah U.
Im interested in the pB&J mix! I'd love to try the Sing Buri Cashew Blend. I Voted for you on Top Mommy blogs . i follow SahaleSnackson twitter - js22222222 . I'd like to try the Tuscan almonds! Banana Walnut Chocolate Biscotti Crisps would be my choice! Would love to try the Almond Vanilla Latte biscotti crisps. I'd love to try the Valdosta Pecans with Sweet Cranberries, Black Pepper and Orange Zest. It would be wonderful in a chicken salad or a green salad! Valdosta nut blend sounds interesting. As do all the nut blends. I'd like to try the Almonds with Cranberries, Honey & sea salt glazed nuts. I'd also love to try the Pomegrante Cashew biscotti crisps. I have seen these for sale at Starbucks, but haven't yet tried any. Maybe soon... Meanwhile the Ksar nut blend, with Pistachios with Sesame Seeds, Pepitas, Fig + Moroccan Harissa, is really calling my name! Almond Vanilla Latte biscotti crisps.